Two pro-Hizbollah newspapers criticise the patriarch's decision to travel to Jerusalem to meet the pope, calling it an "historic sin". For others, the controversy shows "bad faith" because it is "unthinkable" for the patriarch not to welcome the pope in his diocese. 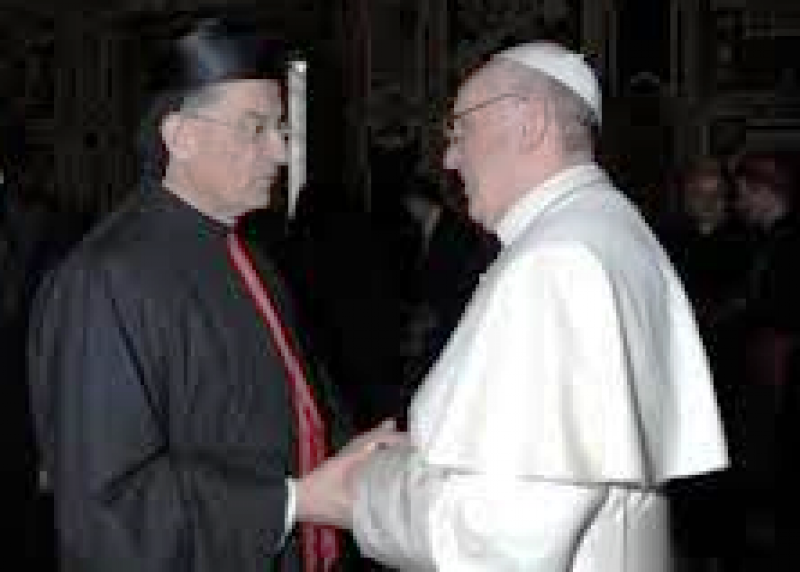 Beirut (AsiaNews) - Maronite Patriarch Beshara Rai has reacted negatively to a "shameful" campaign that aims at stopping him from accompanying Pope Francis on his pastoral visit to Amman (Jordan) and the Holy Land (Jerusalem and Bethlehem ), on 24 to 26 May. "The protest is unnecessary," he said today at Lourdes, where he is accompanying a delegation of the Lebanese chapter of the Order of Malta on an annual pilgrimage to the French shrine. Yesterday, he led 25,000 people in prayer for "the tortured and blood-stained East, crucified on the cross by religious hatreds and political and economic interests." As for the controversy, "the Pope has honoured us with his visit to the diocese of patriarchy and it is normal that the patriarch should welcome him," he explained. The Maronite Church, the largest Catholic community in the East, has two separate archdioceses covering Israel, the Palestinian territories and Jordan. The first, which is a patriarchal vicariate, includes Jerusalem, Palestine and Jordan, and the second covers the territory of the State of Israel within its pre-1967 borders. In noting that he would not meet Israeli leaders, the patriarch said he was "aware that Israel is an enemy state that is occupying Lebanese territory," but he insisted that he respects "Lebanese law." What is more, "I am sorry to see that some Lebanese want to create problems where none exist," the patriarch insisted. "The Lebanese should stay calm and stop fuelling this debate. It is shameful." Here, he was referring to two pro-Hizbollah and pro-Syria Lebanese newspapers, which on Saturday criticised his decision to visit the Holy Land, especially Jerusalem. In an article titled 'Historic sin: Rai goes to Israel,' As-Safir called the trip a "dangerous precedent" that "serves neither Lebanon and the Lebanese, nor Palestine, much less Christians and Christianity." For its part, Al-Akhbar wrote that a group of Lebanese politicians would try to persuade Card Rai not to undertake the visit to Jerusalem as long as it is under Israeli occupation, since this visit means dealing with the occupier. In view of the situation, Mgr Boulos Sayah, vicar general of the Maronite Patriarchate and former bishop to the Holy Land, decided to clarify some points, noting that the patriarch will "go to Jerusalem only to welcome the Pope", that he would not have done it under any other circumstance. Mgr Sayah also noted that the anti-visit campaign "is acting in bad faith", that it would be "unthinkable" for the Maronite Patriarch to refuse a papal invitation to visit Jerusalem and Bethlehem. He further pointed out that the patriarch will not pass through an Israeli airport, but will go first to Amman, where the papal visit will start, before going by bus to Bethlehem, and then travel to Jerusalem. The Pope will instead fly to Israel from Amman. After the pope's departure, Patriarch Rai will go to the Galilee, including Nazareth and Haifa, to visit Maronite parishes, "as he is duty-bound," and which the "local bishop does on a regular basis with no one complaining."